I can’t believe I just wrote that title, “U2 The Joshua Tree Tour 2017.” I mean I’ve known for weeks and I’ve bought all the tickets, but wow this is really happening. After 30 years and missing it the first time around (because I wasn’t allowed to go, not because I didn’t want to), I finally get to go to THE JOSHUA TREE TOUR! Now it seems the final tour dates have been announced and all the tickets have been sold, and I have made all of my plans for this wonderful 30th Anniversary Joshua Tree Tour. I am seeing 10 shows in Chicago, Pittsburgh, Miami, Louisville, Philadelphia, DC, New Jersey and Cleveland. And as luck would have it, the Cleveland show will be my 100th U2 show. It means a lot to me to have my 100th U2 show a Joshua Tree show. I have GAs for all shows, except I have RedZone for Miami. I used my presale code (I am one of the rare U2 fans who only have one U2.com subscription) to buy GAs for Cleveland, New Jersey, Philadelphia and DC as I thought they would be the most difficult of the shows I was going to (not DC but that’s my local show). On the public sale the following week, I got a RedZone for Miami and a GA for Pittsburgh. The RedZone is really expensive but I wanted to do it for at least one show and it is for a good cause. I picked Miami because I assume it will be really hot and thought it would be nice to be close and not too crowded when it’s that hot out. Both the presale and public sales were SO easy using both my Ticketmaster App on my phone and the Ticketmaster site on my laptop at the same time. I got tickets immediately, maybe the easiest time I have ever had getting U2 tickets. I originally had six shows hoping there would be two shows in most cities, but knowing there would be second shows in LA, Chicago and New Jersey (the stadium equivalency to New York City). I was right about those three cities. The day of the public on sale U2 announced there would be second shows in LA, Chicago and New Jersey. With that second New Jersey show, that gave me 7 shows (I’ve never gone to less than 8 shows on any U2 tour). I had regretted not going to Chicago since it was on a weekend, but flights and hotels were so expensive. I decided since there were now two shows in Chicago, I couldn’t miss them – plus Chicago shows are always great! So I booked a hotel about a half hour outside the city and just decided I would drive the 10 hours to Chicago (see below for updated travel plans). I tried to get a GA or RedZone for Chicago1, but nothing was available late in the day of the public on sale. But for the same price as a GA (I did not want to pay extra for a resale ticket), I got a seat in the 200 level front row side stage, which should be fairly close (see below for updated Chicago1 ticket info). Now I had my 8 shows. A week later was the public sale for the second shows in New Jersey and Chicago (and LA but I am not going to LA). These sales were not as easy as the previous ones, but at least these two shows went on sale at different times because they are in different time zones. New Jersey was a little difficult – it took 10 minutes instead of 2 minutes to get a GA. Chicago was just as difficult, but also scored a GA after about 10 minutes. What was surprising was for both shows the Ticketmaster site delivered before the Ticketmaster App on my phone – that has never happened before. After securing these shows, someone mentioned to me GAs were still available for the Tampa show, so I thought I’d grab one just in case I decide to go since I was going to be in Miami anyway. Now I had 10 shows. **UPDATE**: After all this was said and done, U2 added a show on Friday June 16th in Louisville, Kentucky. I decided that I couldn’t do Tamp and Louisville, so I have decided to skip Tampa and go to Louisville. This works out best for my work schedule and a lot of my friends are going to Louisville and hardly anyone I know was going to Tampa. **Update** I continue my musical journey Saturday June 3rd as I board a 8am flight for Chicago. (I was going to drive the 10 hours, but the flights finally went down a little. But if for some reason my parents cannot watch my dogs, I will drive and use my flight next year.) I would have liked to flown in Friday, but flights were a lot cheaper Saturday morning, so no MeetUps for me Friday night. I am staying at the Hyatt Place Chicago Midway Airport, which is obviously at Midway Aiport and about 10 miles to Soldier Field. (I was staying at the Ameristar Casino Hotel in East Chicago, Indiana, but it was at least a half hour to Soldier Field and about an hour from the airport.) This Hyatt is about twice the price as the casino hotel, but it has free shuttle to/from the airport, free shuttle to/from CTA Orange line, free hot breakfast, 24 hour restaurant and just 3 blocks from Giordano’s pizza! Either my friend Sharon will drive us or we will take the subway. Thanks to my friend Tara, I now have a GA for the first Chicago show on Saturday! I was fine with my seat, but I much prefer GA especially for my first Joshua Tree show. My flight Morning after the second show isn’t until 11am. If an earlier one opens up, I’ll take it but right now the early morning flights are sold out Monday. If you are going to the U2 shows in Chicago and would like to join our facebook group, please click here. Two days later on Wednesday June 7th, I drive four hours up to Pittsburgh for my 3rd U2 Joshua Tree 2017 show. I will probably leave around 7 or 8am because I would like check in at my hotel and be at Heinz Field by 1pm. I am staying at the Holiday Inn Express & Suites Pittsburgh North Shore on the other side of PNC Park (or at the Renaissance Pittsburgh Hotel across the river if my dogs are with me). Both hotels are within walking distance to Heinz Field. I’ll drive home the morning after the show. Like Chicago, Pittsburgh was not a show I was originally planning on going to because it was on a weekday. (All of my vacation time is slated for my Elvis trips to Memphis in March and August.) Then I remembered what a special place Pittsburgh is for me and U2 (the hug from Larry on 360) and the fact that it is only 4 hours from my house. How could I not see U2 that close to home? If you are also going to the U2 show in Pittsburgh and would like to join our facebook group, please click here. The day after I get home from Pittsburgh is the Neil Diamond show in Baltimore. Luckily that is only a 20 minute drive from my house. I have never seen Neil Diamond and am really looking forward to the show from my seat on the floor in the center section about 25 rows back. But truth be told had the U2 tour schedule been released first, I probably would not be seeing Neil on June 9th. The day after the Neil Diamond concert in Baltimore, I get on a flight for Ft. Lauderdale, Florida for the U2 show in Miami Saturday June 11th. It is not really in Miami, it is halfway between Ft. Lauderdale and Miami at the Hard Rock Stadium in Miami Gardens. I land in Ft. Lauderdale at 8:30pm Saturday June 10th. I have booked a room at the Stadium Hotel just a mile from the stadium and next door to a little casino. This “Miami” show should be an especially fun show since I am guaranteed to be up front in the Red Zone – the only Red Zone show I am doing. The morning after the concert I have a 6am flight home on Monday June 12th, which gets me back at 9am so I can work the rest of the week until the Louisville show. If you are going to the U2 show in Miami and would like to join our facebook group, please click here. Three days later on Thursday evening June 15th, I fly to Lousiville arriving at 7:30pm for the U2 show the next day on June 16th for my 5th Joshua Tree show. I am staying at the Super 8, which is only a few blocks from the Papa Johns Cardinal Stadium at the University of Louisville and very cheap. Hopefully it is also very clean. I don’t need fancy, but I do need clean. It is also walking distance to a Cracker Barrel. (For fear the Super 8 isn’t the greatest, I have now also booked Holiday Inn Airport Fair/Expo which is just a block or so further and about twice the price.) The morning after the show I take a 7am flight back home, so I can be at my friend’s wedding that evening in Maryland. If you are going to the U2 show in Louisville and would like to join our facebook group, please click here. The morning after my friend’s wedding, I am driving two hours up to Philadelphia on Sunday June 18th for the U2 show at Linc. Actually it might only be an hour drive if I decide to stay at a hotel after the wedding, since the wedding is halfway between my house and Philly. But either way, I am not staying in a hotel in Philly – just driving up and back. I was going to arrive around noon, but I have just realized there is a baseball game at 1:30 (all the stadiums are in one complex), so I am going to get there by 11am (or earlier) to avoid all that baseball traffic (plus it’s Father’s Day). Maybe I will hang out at Xfinity Live – that’s a fun place with lots of places to eat and drink. If you are going to the U2 show in Philly and would like to join our facebook group, please click here. Two days later on Tuesday June 20th, I will drive less than an hour to FedEx Field in DC (really it’s in Hyattsville, Maryland) for my 7th U2 show of the tour. I will probably leave work around noon. And like with the Philly show, I will just be driving down and back the same night – no hotel needed. “Sleepin in my own bed tonight” as Bono would say. If you are also going to the U2 show in Philly and would like to join our facebook group, please click here. That Saturday June 24th I am driving back up to Philly, but not for a U2 show. This time it is for the NKOTB show (also with Boyz II Men and Paula Abdul) at the Wells Fargo Center. I also have GA for this, but this is a guaranteed close to the stage GA. The GA is an enclosed section between the two stages inside the catwalk. I will just drive up and back for this show. The next night I am seeing the NKOTB show again in DC at the Verizon Center – in a VIP seat just outside of the GA section. Please do not judge me for also being a New Kids on the Block fan. It’s a totally different fandom and show, but just as fun. And by the way, Rocco is also the stage manager for NKOTB. I am not real sure what he’ll be doing this summer, but I assume U2 pays more, so he’ll probably be with them. Three days later I will drive up to New Jersey for the two U2 shows on Wednesday June 28th and Thursday June 29th. It is just under a four hour drive, so I will probably leave at 9am (any earlier and I would get stuck in rush hour traffic on 95). I will either be staying at the Extended Stay America Meadowlands East Rutherford if my dogs are with me or at the Courtyard Lyndhurst Meadowlands. I have stayed at both of these hotels in the past and they are good, but the Courtyard is amazing with fantastic customer service. Both hotels are right across the street, but it is across the highway so you still have to drive to MetLife Stadium or take a shuttle that most hotels supply for events. I am driving up the morning of the first show so after checking in at the hotel, I probably won’t get over to MetLife Stadium until 2ish. I can go over earlier for the second show the next day. I am not queuing for any of the shows this tour (haven’t since Elevation), but I will be arriving early to see the band drive in and maybe have another encounter with Lawrence. The morning after the second Jersey show on Friday June 30th, I leave for Cleveland – driving seven hours. I will probably leave as early as 9am because I need to get to Cleveland, checked into my hotel and to the NKOTB show at Quickens Loans Arena by 6pm. (I had not planned on going, but the NKOTB show is in Cleveland the night before the U2 show is in Cleveland and they had GA available – why not?!) In Cleveland, I am staying at the DoubleTree (or at the Aloft if my dogs are with me) – both are within walking distance to First Energy Stadium. This U2 show in Cleveland is the last U2 Joshua Tree 2017 show in North America and my 100th U2 show. Since ZooTv in 1992, I have been to 100 U2 shows. And the fact my 100th U2 show is a Joshua Tree show means more to me than I can express. If you are going to the U2 shows in Jersey and would like to join our facebook group, please click here. If you are also going to the U2 show in Cleveland and would like to join our facebook group, please click here. If you are still reading, bless your heart – and thank you. I know that was a bit tedious, but I like to get all of my plans out of my head and on paper – or online in this case. I am really looking forward to the road trips this tour, like I did back on 360 and it was such a blast! I flew everywhere on the ieTour and it just wasn’t as much fun. I love a road trip! And although I have all GA tickets for my 10 shows (except for one redzone), I will not be waiting in the GA line all day. I do plan on arriving to stadiums by 1pm to see friends and hang out and wait for the band who usually drive in around 3pm. Again, I did not want U2 to tour this year with everything else I already had planned, but this is The Joshua Tree Tour and I am not missing it the second time around. (For more on this, please click here.) See you in June! 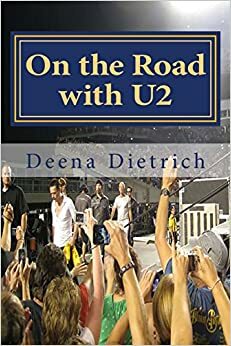 In the meantime, please follow me on Twitter @OnTheRoadWithU2 and if you’re feeling really adventurous check out my book On the Road with U2: my musical journey – Larry already has his copy. Great to read about your JTT journey. I’ve only seen them 11 times since Zooropa, but this Summer I’m seeing them in Dublin for the first time!!! This is going to be so special to me!!!!! That’s awesome! Thanks for reading! Can’t wait to hear what you think about Dublin. We will be in the red zone in Miami too! Yay! Then I’ll know someone. Please say Hi – I’ll be in my Larry Mullen band shirt.